Figure 1. Treatment of HeLa cells with Paclitaxel stimulates phosphorylation of vimentin at Ser56, while treatment with hydroxyurea reduces that phosphorylation. Neither treatment affects levels of total vimentin. 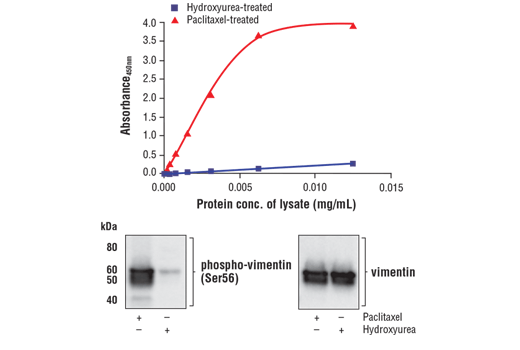 The relationship between lysate protein concentration from Paclitaxel treated and hydroxyurea treated HeLa cells and the absorbance at 450 nm using the FastScan™ Phospho-Vimentin (Ser56) ELISA Kit #38107 is shown in the upper figure. The corresponding western blots using phospho-vimentin (Ser56) antibody (left panel) and vimentin antibody (right panel) are shown in the lower figure. HeLa cells were treated with 100 nM Paclitaxel #9807 or 4 mM hydroxyurea for 18 hr at 37°C and then lysed. The FastScan™ Phospho-Vimentin (Ser56) ELISA Kit is a sandwich enzyme-linked immunosorbent assay (ELISA) that detects endogenous levels of vimentin when phosphorylated at Ser56. To perform the assay, sample is incubated with a capture antibody conjugated with a proprietary tag and a second detection antibody linked to HRP, forming a sandwich with phospho-vimentin (Ser56) in solution. This entire complex is immobilized to the plate via an anti-tag antibody. The wells are then washed to remove unbound material. TMB is then added. The magnitude of observed signal is proportional to the quantity of phospho-vimentin (Ser56). Antibodies in kit are custom formulations specific to kit. The FastScan™ Phospho-Vimentin (Ser56) ELISA Kit detects endogenous levels of vimentin when phosphorylated at Ser56 as shown in Figure 1. This kit detects proteins from the indicated species, as determined through in-house testing, but may also detect homologous proteins from other species. The cytoskeleton consists of three types of cytosolic fibers: microfilaments (actin filaments), intermediate filaments, and microtubules. Major types of intermediate filaments are distinguished by their cell-specific expression: cytokeratins (epithelial cells), glial fibrillary acidic protein (GFAP) (glial cells), desmin (skeletal, visceral, and certain vascular smooth muscle cells), vimentin (mesenchyme origin), and neurofilaments (neurons). GFAP and vimentin form intermediate filaments in astroglial cells and modulate their motility and shape (1). In particular, vimentin filaments are present at early developmental stages, while GFAP filaments are characteristic of differentiated and mature brain astrocytes. Thus, GFAP is commonly used as a marker for intracranial and intraspinal tumors arising from astrocytes (2). Research studies have shown that vimentin is present in sarcomas, but not carcinomas, and its expression is examined in conjunction with that of other markers to distinguish between the two (3). Vimentin's dynamic structural changes and spatial re-organization in response to extracellular stimuli help to coordinate various signaling pathways (4). Phosphorylation of vimentin at Ser56 in smooth muscle cells regulates the structural arrangement of vimentin filaments in response to serotonin (5,6). Remodeling of vimentin and other intermediate filaments is important during lymphocyte adhesion and migration through the endothelium (7). During mitosis, CDK1 phosphorylates vimentin at Ser56. This phosphorylation provides a PLK binding site for vimentin-PLK interaction. PLK further phosphorylates vimentin at Ser82, which might serve as memory phosphorylation site and play a regulatory role in vimentin filament disassembly (8,9). Additionally, studies using various soft-tissue sarcoma cells have shown that phosphorylation of vimentin at Ser39 by Akt1 enhances cell migration and survival, suggesting that vimentin could be a potential target for soft-tissue sarcoma targeted therapy (10,11). Eng, L.F. et al. (2000) Neurochem Res 25, 1439-51. Goebel, H.H. et al. (1987) Acta Histochem Suppl 34, 81-93. Leader, M. et al. (1987) Histopathology 11, 63-72. Helfand, B.T. et al. (2004) J Cell Sci 117, 133-41. Tang, D.D. et al. (2005) Biochem J 388, 773-83. Fomina, I.G. et al. (1990) Klin Med (Mosk) 68, 125-7. Nieminen, M. et al. (2006) Nat Cell Biol 8, 156-62. Yamaguchi, T. et al. (2005) J Cell Biol 171, 431-6. Oguri, T. et al. (2006) Genes Cells 11, 531-40. Zhu, Q.S. et al. (2011) Oncogene 30, 457-70. Xue, G. and Hemmings, B.A. (2013) J Natl Cancer Inst 105, 393-404.